Dr Sarah Mackenzie Ross accepts private referrals from a number of sources including GP's and medical specialists (medical referrals). Patients can also refer themselves for an assessment (self-referral). 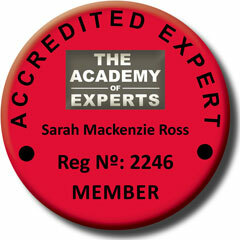 Sarah is committed to evidence-based practice, which means psychological methods, models, theories and knowledge used have been derived from reproducible research findings; and she is committed to maintaining professional standards and ethical practice as outlined by The British Psychological Society (BPS). Dr Sarah Mackenzie Ross is also medical expert witness and provides assessments of clients involved in personal injury cases following road traffic accidents, industrial injury, medical negligence and criminal assaults. She gives an opinion about clients' current psychological status (emotional or intellectual) their likely prognosis, employability or rehabilitative future. She is familiar with court and legal proceedings, has undergone extensive training to develop her expert witness skills, has been accredited by and is a member of a number of legal organisations concerned with expert witness work such as the Academy of Experts, Association of Personal Injury Lawyers, Xpro Register, UK Register of Expert Witnesses. Dr Sarah Mackenzie Ross provides assessments for organisations and businesses to determine whether the mental health & emotional well-being of employees is affecting performance in the workplace or absentee rates. 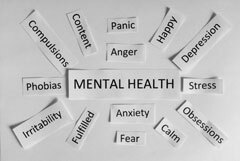 Assessment of emotional state - assessment of a variety of mental health problems such as depression, anxiety disorder, post-traumatic stress disorder, adjustment disorders, sexual or marital problems etc. Assessment of cognitive functioning - intellectual level, memory functioning, language, perception, behaviour and personality following traumatic brain injury, neurological disease (e.g. dementia), general illness or medical treatment (e.g. chemotherapy, surgery, radiotherapy). Assessing the impact of toxins on human behaviour, cognition and emotion. Clinical Psychologists are healthcare professionals who apply psychological theories and methods to help reduce psychological distress and promote emotional well-being. They work in a range of different services and with a number of different client groups such as children, adults, older adults, individuals with learning disabilities, physical disabilities or health problems. They have an undergraduate degree in psychology and a postgraduate degree in clinical psychology. They are applied scientists committed to evidence-based practice. Neuropsychology is the scientific study of the relationship between brain structure and psychological processes such as emotion, perception, memory, language and overall intellectual functioning. Clinical Neuropsychologists are interested in the assessment, management and rehabilitation of neurological injury or disease. They use objective psychometric tests to characterise the cognitive, emotional and behavioural changes that may occur following brain injury or disease. 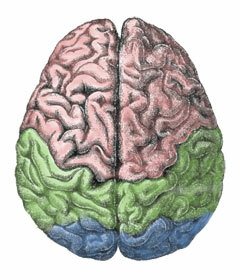 Clinical Neuropsychology is a specialist field of Clinical Psychology. Clinical Neuropsychologists are clinical psychologists who have undergone further training to acquire and in depth knowledge of neuroanatomy, neuropathology, biochemistry and psychopharmacology. Appointments are in Surrey and London. Contact Sarah for information about waiting times.